We’re pleased to welcome back the mother-daughter team of Arden & Rosana, who create dog and cat accessories that spark joy through Darling Dear Co! You’ll definitely want to dress your pet up for that special holiday party or photo shoot with one of their adorable bow ties. Catch them at the Bison from November 30 to December 2, follow Darling Dear Co. on Instagram (@darlingdearco) to see more of their work and read on to find out what inspires them. Darling Dear Co: Darling Dear Co. was an idea my mom and I conceived a few years ago, thinking it would be fun to create cute pet accessories together. I am a die-hard dog lover and have been asking for one since I was 4 but, funny story, we don’t have pets of our own! My mom is allergic and struggles with OCD due to childhood trauma, so we meet in the middle and make accessories for pets so that I can live vicariously through the adorable photos we receive from our customers. DDC: We aspire to make pet products that are well-crafted and long lasting. Basically, items that you can hopefully bring out for every holiday and event and still have looking pristine year and year! If you can use your bow and collar set for years ahead for family photo shoots, and never have to get a new one, that would make us really satisfied. With that said, we don’t skimp out on details and materials—our bow ties are double layered, and have interfacing so they are stiff, and keep their shape. DDC: We are amazed by the support that the Edmonton community gives to local and handmade creators. We were recently a part of CTV Edmonton segment by Dez Melenka that profiles local news and we were really overwhelmed by the kind and positive messages that were sent to us through social media after it went live! It was definitely a huge highlight for us in all the time that we’ve been growing Darling Dear Co and we couldn’t have done it without the supportive community around us. DDC: Locally, we absolutely adore the workmanship of Sylvia Soo! The quality and care she puts into each of her designs never ceases to amaze. I particularly love her box bag, especially the custom one with Oxblood leather that she’s been posting about on Instagram! Also, I absolutely adore the illustrations of Janice Sung who is based in Toronto. She also has the cutest dog! We’re stoked to have Janelle Holod of Cyanotype Paper Goods back at the Bison with all of her pretty paper products! Janelle is passionate about plants, patterns, and paper, and her handmade paper goods and organic illustrations are incredibly eye-catching! Catch her at the Bison from December 7-9, Follow her on Instagram (@CyanotypePaper) and read on to discover where she finds her inspiration! Cyantope Paper Goods: Plants are a major source of inspiration for me, but that also applies to everything natural-history-related! I love seeing art, design, and science mixed in projects. I find patterns really comforting to look at and to create. CPG: This year I've introduced new products featuring new patterns! Pocket mirrors, stickers, and gift-wrap sheets. CPG: I take a lot of care creating my products, and I'm selective about my materials in order to have great quality stuff! I also bring unique illustrative qualities to the patterns with which I create my products. CPG: The Edmonton community is so supportive! It's a great place to try new and adventurous things. CPG: Right now I'm really digging Olivia Herricks' stuff and Archer and Olive! CPG: We do a Friendsmas gift exchange on New Year’s Eve! That way everyone can spend Christmas with their family, and we still all get together. New vendor alert! We have your new favourite kind of cookie at the Royal Bison this season: wood cookies! Edmonton based artist, Jovi Klak, digitally or hand paints expressive mandalas on wood cookies with vibrant and unusual palettes! Catch her at the Bison from November 30 to December 2, Follow Jovi on Instagram (@jovi.klak) to view more of her work, and read on to see where her inspiration comes from! Jovi Klak: I am compelled to create because it allows me to stay present. If I encounter something that moves me, there is an urge to capture its colours and patterns. I’m also hungry to improve and know I’ll feel terrible if I stop. JK: I’ll be using a different type of wood for my cookie paintings. I spent one day this spring chain-sawing and sanding a fallen Poplar on my parents’ farm. Getting materials from a familiar area makes me appreciate the pieces more. With the upcoming holiday season, I’ll also be printing greeting cards and making ornaments. JK: I often gather colours from my surroundings, but am drawn to vibrant, moody, and unusual palettes. I enjoy combining expressive lines with orderly details and consider the wood’s original pattern when painting cookies. I ultimately believe everyone’s work is different (even if using a similar approach). JK: I can be quite introverted, but I make time each week to have a drawing night with a friend. It’s great bouncing ideas and not working in a bubble. I’m looking forward to meeting more creatives at Bison! JK: I’m inspired by so many people and things. The rhythms and compositions of Gustav Klimt’s work. Thick brush strokes from impressionist paintings. Henna artists painting limbs in the streets. Marimekko patterns. Patterns on thrift store clothing. Patterns found in nature… So. Many. Patterns. I do have a creative crush on Joan Sherman though. She is an Athabasca-based artist who paints, sketches, and writes about the natural world she loves. A portion of her art sales go towards supporting wildlife habitat conservation, and for over a decade she has sponsored 50+ high school students to attend a week long Visual Arts program. I was one of those students, and it felt really great knowing that there was a creative advocate in my hometown. I also met Joan years later at a craft fair, where she gave me a sketchbook and championed me to fill it. This woman oozes encouragement and good vibes—who wouldn’t have a crush on that? New vendor alert! Meagan of Small Arms Stitches first tried her hand at cross stitching back in 2017 and found out it was the perfect relaxing hobby to do while watching Netflix. She draws her inspiration from memes, video games, and pop culture. Catch her at the Bison from December 7-9, follow Meagan on Instagram (@small_arms_stiches) to see more of her work and read on to learn what inspires her! Small Arms Stitches: I’ve always loved making something with my hands and I find fibre art so relaxing. It makes my day when my work puts a smile on someone’s face, or even better if they just start laughing! SAS: Pretty much everything! This is my first season being a vendor. SAS: My work has a heavy meme influence. I had lots of fun making video game meme mashups which I haven’t seen from another maker. SAS: I love the creative vibe from Edmonton. Tons of festivals and events all year, it’s great! I just moved to Edmonton this spring, so I’m looking forward to continuing to discover the creative community. SAS: My all0time favourite artist right now is brecht vandenbroucke, who’s an artist and illustrator. SAS: Egg nog and Baileys, cuddling up in flannel, and listening to U2’s “Baby Please Come Home” on repeat. New vendor alert! NIUBOI came from space to save the world from a life of blasé mundanity. They are a trans non-binary alien who specializes in intergalactic weirdness, and we’re so excited that they’re making a stop at the Bison! Catch them at the Bison from December 7-9, follow NIUBOI on Instagram (@NIUBOI) to see more of their eclectic mix of pins and zines, and read on to discover what makes them tick! NIUBOI: My first passion is performing, but I have always loved drawing and making things with my hands. When I met Skye of Fingers Crossed Press, I knew that she was the perfect person to help make my ideas come to beautiful fruition. N: All my items are new! NIUBOI x Fingers Crossed Press have collaborated to create enamel pins, hats, and stickers. I’ve also created a NIUBOI zine. N: I have the only They/Them pronoun pin designed in Edmonton! N: We are a welcoming and diverse community making vibrant and contemporary art in every discipline. Edmonton’s artistic entrepreneurs are creating their own opportunities and audiences, and they are challenging Edmontonians to value art as a vital part of their community. I am so proud to be a part of Edmonton’s revolution as we move towards a more engaged community. N: I love Stephanie Simpson’s prints! My partner and I have a giant print of Stephanie’s Waterton in our living room. Her work is so bold and colourful! I also have a deep love of artisanally handcrafted stuffed monsters, so Papercut Monsters and Monsters and Mountains are my go-to Bison stops every year. N: Every December I make a big meal for the first day of Hanukkah. Matzo ball soup and latkes is my number-one favourite meal; it’s comfort food. It’s the perfect meal for a cold December night. New vendor alert! Kait Dirk is an artist who likes to explore surrealism and the dream realm. She’s been creating ink drawings and oil paintings to bring those dreams back to reality, and you’ll definitely won’t to check out her super cool work at the Bison! Catch her at the Bison from November 30 to December 2, follow Kait on Instagram (@kaitdirk) and Twitter (@kaitdirk) and read on to discover where her inspiration comes from! Kait Dirk: Artists have a very fun pursuit where they get to make the intangible tangible. They get to explore the inner depths of their mind and bring what they find to life. Creating art has allowed me to look deeper into the nuances of reality and I am grateful for that. I am most joyful when I am creating and will do it for the rest of my life. KD: I have just opened an online shop where I’ll be selling both originals and prints. A very fun leap! I’m also delving into the world of pin creation, they are just so charming and cute and I’d like to design a few of my own. KD: Prints will always be on paper, but the subject matter will always change artist to artist. Everybody is unique! I bring soft colour palettes and dreamy settings. Dark subject matter will also usually leak into my pieces. I’d say my work is darkly sweet. KD: I am grateful for it! Any community of artists is wonderful. It’s encouraging and inspiring to see my fellow city artists follow their dreams. KD: Local crush: Kristine MacDonald! I went to university with her and after school she started a beautiful copper jewellery business. She showed me that you don’t need a 9-5, but rather you can do what you love and get paid for it. I’ve loved watching her business grow and evolve. Far Away Crush: Emilio Villalba. He’s an oil painting artist from San Francisco. His paintings just touch my soul. They have a touch of darkness, beautiful color palettes, and a freeness that you can feel. KD: Have the fireplace and the fireplace channel going at the same time for an ultimate relaxation moment. Third-generation concrete craftsman Ryan Spotowski is back at the Royal Bison! His company, Ryspot Design, is focused on creating limited production home goods using non-traditional materials. Catch him at the Bison both weekends, follow Ryan on Instagram (@ryspot) or Twitter (@rypsot) to see more of his work, and read on to discover what inspires the conversational home decor he creates. Ryspot Design: To create conversation. We have become isolated and members of echo chambers; design can change that by providing approachable objects that inspire conversation. Objects can be totems that tell stories, our experiences, and desires. We don’t touch enough of what is real. I want to inspire that connection and get people excited. RD: New terrazzo based pieces. My family has been working with terrazzo for over 60 years and I’ve always been a fan. Terrazzo is more luxurious than concrete, but still has a natural look. I’ve been exploring new ways of processing my materials and playing with textures. RD: Edmonton probably has the most designers who work with concrete in the world, including Concrete Cat and Beton Brut (even though she’s in Saskatchewan now). I think my niche falls in the ability to process concrete and similar materials once it’s cured; to refine the material into something completely different. I’m also exploring resin and waste materials. RD: Edmonton has a strong community of designers and people who are passionate about creating. People get really excited when you tell them you’re creating things; there’s a desire to collaborate and build. It’s less of a gallery-type city. People want to talk to you about design, they want to be a part of changing the city. RD: On the local scene, I’m really impressed with Sam Knopp and Stranger Design, but my wife will probably lock me out of the house if I buy another mug. Over the past couple years, it’s been really exciting to get to meet other creatives and learn their stories, it’s really hard to select only a couple people when so many have become friends. RD: I’ve only been married a couple years, so I’m still building new traditions with my wife. You’ll want to check out this next vendor for beautiful decor for your home and to decorate the tree this year! 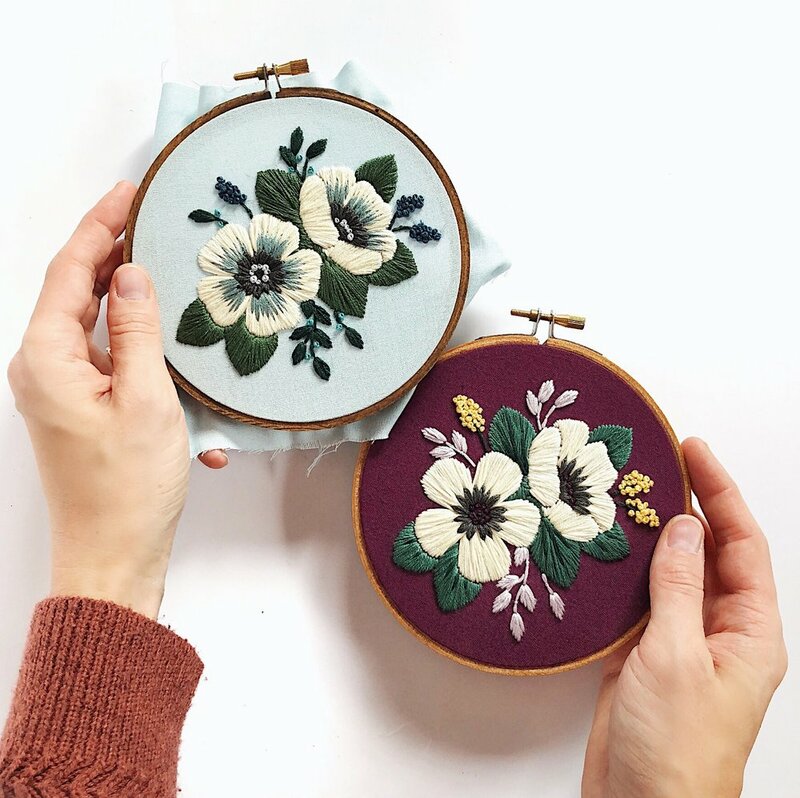 Based in Edmonton, Alex Stratkotter of Florals and Floss designs and hand stitches embroidery hoops as home decor, creates DIY kits and patterns, and teaches workshops. All designs are inspired by her experiences and nature and where she’s from. Catch her at the Bison from November 30 to December 2, follow Alex on Instagram (@floralsandflossembroidery) and read on to learn where she gets her inspiration! Florals and Floss: All of my work is inspired by nature. Whether it’s a walk in Edmonton’s river valley or working in the garden, there’s always some flower or natural colour scheme calling me to create. FF: Christmas ornaments! They’re so much fun to create, and because embroidery is a slow art, it’s a nice change to have a very small surface area to fill instead of a larger hoop. FF: Embroidery is once again gaining popularity! What sets my work apart from other fibre artists is my style: I try to keep my designs clean and simple, but with little details to keep my pieces interesting. FF: The Edmonton creative community is amazing, and I’m so grateful to be a part of it. Never will you meet a larger and more inclusive group of talented and hardworking people. FF: This is a hard one as I could give you a huge list and not hit everyone. I have to shout out some of my fellow fibre artists: I adore Ferns School of Craft, Long Gone Arts, and Nova Mercury! Some of my other creative crushes: Rachel Beyer, YEGwoodworks, Stephanie Simpson, and From Harper. FF: Basically making and eating all the food! Also watching It’s a Wonderful Life and Die Hard. On top of working as a graphic designer and illustrator, Paul Twa integrates a colourful and illustrative flair into his line of products, which include cool pillows and apparel, for people’s homes and wardrobes. The images he creates take inspiration from history and the natural world, which he then applies to his products to allow them to become part of one’s daily life. Catch her at the Bison from November 30 to December 2, follow him on Instagram (@paultwa) to see more of his work and read on to discover what inspires him! Paul Twa: It’s my way of contributing to the visual world we live in and expressing all my built-up creative energy that needs releasing. Design not only exists in the present but also becomes a part of our history and that legacy is something I find so rewarding. PT: Brand new illustrations for apparel and pillowcases! PT: My work embraces colour, texture, and pattern enthusiastically. I’m drawn towards dense visual imagery and nods to the past which differs from more modern/minimalist aesthetics. PT: It has been exciting to transition from being a full-time student to a contributing creative in Edmonton. I have admired and looked up to so many in our community for years and it never ceases to amaze me how much talent is packed in this city and how welcoming they are to give advice and encouragement. PT: My favourite contemporary creators are Brad Woodward and Josh Emrich, who both work as graphic designers while also selling their personal work on the side. 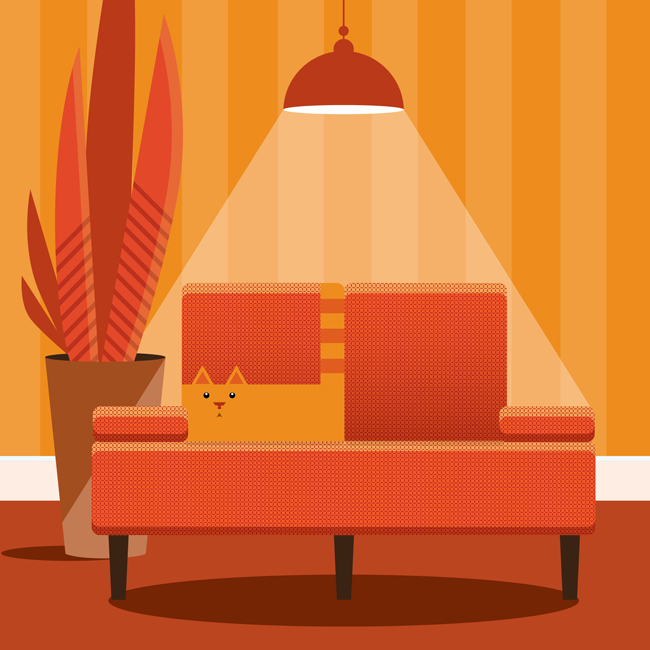 Their work is infused with humour and a retro sensibility I always drool over. More historical inspirations include Robert Rauschenberg, James Rosenquist, Charles Rennie Mackintosh, and my great-aunt (a textile designer) Sylvia Chalmers. PT: Decorating gingerbread houses. It’s something that brings me and my other creative siblings together over the holidays and the assembling process is even more fun than eating it afterwards. Smithstine Copper is a one-woman studio creating prairie inspired and custom copper jewelry and accessories. Kristine MacDonald, of Smithstine Copper, has been making jewelry since 2011, first joining us for the holiday season in 2013. "Copper has become my metal of choice because it is soft, shines up beautifully and is not particularly common in jewelry making. My copper designs are mainly prairie related because I appreciate Alberta's diverse features, creatures and landmarks." Catch her at the Bison both weekends, Follow her on Instagram or Twitter to keep up with her new work and read on to learn what inspires her! Smithstine Copper: I love working with my hands and creating tangible, wearable art inspired by the things I encounter on adventures. SC: Copper enameling! I’ve recently begun learning the craft of copper enameling, which is the process of sifting a fine glass powder onto copper and heating it up in a very hot kiln. The glass powder melts and fuses to the copper. It creates beautiful, glossy, vibrant colours on the surface of the copper. This was a hobby of my grandma and mom in the ‘70s and I am excited to be able to use some of their tools and kiln. I will have lots of new colourful pieces with me on both weekends of the Bison. SC: Copper is not a particularly common metal in the world of jewelry making. When I began working exclusively in copper I didn’t know of anyone else working with it and ended up self-teaching myself most of the techniques I now use through trial and error. I love it’s malleability, rosy colour and the way it shines up. Copper has many unique properties that make it a dream to wear and to work with. SC: I love being a creative in Edmonton because there is a lot of support within the community and between artists. Others are always willing to share tips, collaborate, and lend a hand. The patrons who attend art and craft fairs are so encouraging and enthusiastic, which I love! I think that Edmonton is often overlooked as a creative hub and maybe that’s why art & design flourish here under the radar. SC: Aurélie Guillaume of Montréal is a creative genius and combines wacky character illustrations and vibrant enamel to make incredibly ornate and unique jewelry. I am in awe of the fine detail she includes in these pieces. SC: We don’t have a lot of traditions anymore, but I always love having friends and family over, decorating sugar cookies, snowy days, and drinking mulled wine. After a big Bison-sized break, we’re happy to have Marc Nipp of El Designo back at the Royal Bison! You won’t want to miss checking out his colourful and quirky illustrations! Of his work, Marc says, “I create bright, clean fun illustrations that utilize my 22 years of design experience to weave in and communicate complex information.” Catch him at the Bison from December 7-9, follow Marc on Instagram (@MuchoElDesigno) to see more of his work, and read on to learn a little bit more about what makes him tick! El Designo: I like creating a new solution to a visual problem. ED: The blend of design & illustration in my work. ED: It’s exciting to see what is produced in Edmonton & that it can compete with the rest of the world! ED: As far as creative types go, my favorites are: Wayen Douglas Barlowe, Alex Ross, Alan Moore & Kevin O’Neill, and Jim Henson. ED: I collect retro tree toppers and set them all up on posts in a line, attached to a 2x4 base. It makes a festive room light! Shaun Adamson, of Adamson and Son, is back with his rad leather goods! He first joined us in December of 2017 and just like his impeccable work, he was a perfect fit! Shaun had this to say of his products: "I make handmade leather goods with the best materials I can find. I strive for simple functionality and to showcase the materials that I use. " Catch him at the Bison from December 7-9, keep up with Shaun's work on Instagram (@adamsonandson), and read on to learn what inspires Shaun! Adamson and Son: It really comes out of a need for a piece or something to have a specific function. I started making leather goods when I wanted a knife roll and carried with a belt and wallet for myself. I really like to think about how I can make things to meet people’s needs. Leather is such a cool product and I love all the different things that you can do with it. AS: I’m always on the hunt for new and unique leathers and I have so many ideas that I just haven’t taken the time to carry out the whole prototyping process. AS: I often wonder this myself, but I think it’s just the simplicity and the character of the materials that I use. AS: Oh man! We have so many good markets here and so many people who are willing to share their knowledge and expertise. AS: I recently picked up a couple prints (actually it was a trade for a belt… how great is that?!?) from Stephanie Simpson to put in my son’s room that are beautiful. My wife and I also love our Kalika Bowlby mugs and Prospero Pottery bowl that we got at Bison. And I’ve enjoyed getting to know Like Grandpa Grooming Products at the markets and using his grooming products. AS: Growing up, my family used to spread out all the wrapping paper and take a photo of us all lying in it. It hasn’t happened in a while; maybe this is the year to bring it back! Jaymie Campbell of White Otter Design Co. incorporates traditional Indigenous artistry and contemporary fashion to craft gorgeous crafts gorgeous jewellery, wallets, and other pieces. On her art, Jaymie says, “I strive to use authentic materials in all of my work, and you will often see the use of hand-tanned hides, horse hair, and porcupine quills. Much of the material is sourced from local communities and elders, though I put a strong focus on learning the traditional skills in order to use them in her work and pass them down to future generations.” Catch her at the Bison from December 7-9, follow her on Instagram (@WhiteOtterDesignCo) to see more of her work and read on to discover what inspires her! White Otter Design: Creating for me is an important connection to my culture, ancestors, and identity. I love being part of the wonderful artist community and it is important for me to learn traditional skills in order to pass them down to future generations. WOD: This is the first year I have participated in some large Indigenous fashion events and my line has become a lot more diverse. I have started turning some of my large beadwork patterns into jewellery and incorporating some new materials such as horse hair and different furs. WOD: Most Indigenous artists have unique styles that are influenced by our cultural backgrounds, communities and teachers, and mine is no different. I have unique patterns and colours and use a lot of traditional materials that I make or harvest. RB: How do you feel about being a part of the Edmonton creative community, or whichever community you call home? WOD: Oh man. There are so many! Jadial GreyEagle does incredible beadwork and is a massive activist for Indigenous women. She produced her first documentary alongside Tantoo Cardinal this year! SectionThirtyFive is a clothing line designed out of Vancouver but the owner is from Samson Cree Nation outside of Edmonton. He is totally crushing it and moving onto an international stage with Indigenous Fashion. Catherine Blackburn is this artist from Saskatchewan and she is so crazy talented in so many mediums it is mind blowing! WOD: Watching Bing Crosby’s White Christmas with my family. New vendor alert! Peaches Zheng of LifeIsPeachy is an industrial designer, illustrator, problem solver, and learner. She believes that creativity is much more than just a skill: it's a way of life. As a designer, she’s always looking for new perspectives to observe, to think, and to improve. And her main philosophy is: “Life is peachy, so enjoy!” Catch her at the Bison from November 30 to December 2, follow her on Instagram (@peacheszheng) to see more of her work and read on to learn what inspires her! LifeIsPeachy: I feel like I have different perspectives to look at things. And what I do is to visualize it, and I enjoy doing it. LIP: The “Need to…” collection! I tried to capture the moments that a lot of people might have in common. Hopefully my illustrations can bring some smiles to peoples’ face! LIP: I think my work tells the story of who I am and shows different sides of me. RB: Please share a few of your designer, maker, or creative crushes! LIP: Shidayu, Sami Kallio, Patkimpatkim, Gemma Correll, and Liz Climo. New vendor alert! Danielle S. Fuechtmann started weaving a few years ago as a way to unwind and create while she was going to school for graphic design and freelancing as a writer. Since then, she has started making and selling her work under Curious Fox Fibres. Her collection of looms continues to grow, and she’s picked up punch needle and rug hooking. Catch her at the Bison from November 30 to December 2, and keep on top of her love of working with fibres and yarn by following her on Instagram (@curiousfoxfibres). Curious Fox Fibres: I’m a freelance writer and graphic designer; I’ve always been drawn to beautiful, interesting, and well-designed things. When I was studying design, I came across an excellent interview about the importance of having a studio practice and creating physical objects as a designer. This resonated deeply with me and had a strong influence on me during my studies. I love exploring craft, and I’m really passionate about the cultural history of textile arts, particularly its intersection with women’s history and culture. CFF: I’ve been starting to explore smaller goods like pouches and accessories as well as play with larger textile items. CFF: Probably my embrace of colour. When I’m creating things for Curious Fox Fibres, I generally allow myself to intuitively play with colour in a more informal, fun way than when I’m doing my design work. CFF: I love our local creative community! As a freelancer, making relationships with other local creatives has been such an incredible experience. In addition to making some fantastic friends, it’s given me an inspiring and supportive community that has really helped me flourish as a creative entrepreneur. CFF: Oooh, I’m looking forward to shopping at Bang Bang Bijoux’s booth (bring on the statement bling), picking up some new reading material from BiblioBison, and coveting some new coasters from Concrete Cat. Also, don’t be surprised if you see me picking up a bottle of gin from Strathcona Spirits on Sunday to toast a great weekend when I get home! CFF: I’m a big fan of sending greeting cards!